Welcome back to the Gridiron Experts Thursday Night Football Preview! Last week, I had the Texans beating the Dolphins, covering the -7.5 spread in the process. The Texans, led by WRs DeAndre Hopkins and Will Fuller, blew out the Dolphins by a score of 42-23. I was correct in taking the Texans to cover, and with my score prediction, suggested the over on total points, which also hit. The train keeps rolling for the Gridiron Experts Thursday Night Football picks, and we’re onto Week 9! This Thursday Night, the Oakland Raiders (1-6) will visit the San Francisco 49ers (1-7) in a Battle of the Bay Area. The host 49ers are currently (-3) favorites to take this week’s game. Last week, Oakland fell to the Colts by a score of 42-28 at home. On the other hand, Kyle Shanahan’s 49ers dropped a close one to the Cardinals in Arizona, 18-15. These teams have had first halves of the season to forget, combining for a 2-13 overall record. After beginning the season with justified optimism and their young QB, Jimmy Garoppolo, the 49ers’ season took an unfortunate turn when Jimmy G tore his ACL on 9/23 against Kansas City. Since that fateful day, San Francisco has gone winless. CJ Beathard has taken over in relief of Garoppolo and has shown flashes of competence. In 5 starts at the helm for the 49ers, Beathard has completed 60% of his passes, logging 8 TD to 7 INT on 1,252 yards passing. He’s sustained the breakout of TE George Kittle, as well, who has already put up 584 yards and 2 TD so far this season. However, it seems that Beathard is currently nursing a wrist injury, and has missed two consecutive practices to start the week. This obviously brings into question whether Beathard will be able to suit up on Thursday Night. Should Beathard be unable to go, second-year QB Nick Mullens would be under center for San Fran. Mullens, a former UDFA out of Southern Mississippi, completed 31/43 passes for 396 yards in the preseason, netting 1 TD and 3 INT. Obviously, Beathard sitting out would downgrade the 49ers offense even further and would begin to tip the scales in the favor of Oakland. On Wednesday, Coach Kyle Shanahan called Beathard a game-time decision, but he was a limited participant in the walkthrough and some sources expect him to play. With the QB situation quite gloomy, it will certainly affect the pass catchers on San Francisco. The aforementioned Kittle has made the second-year jump. After logging 515 yards last season, he’s already eclipsed that total in 8 games this year. He’s been consistently targeted and has produced accordingly. Aside from Kittle, the receiving corps has left a lot to be desired. Marquise Goodwin, a preseason fantasy favorite, has struggled through injuries and has been mediocre. In 6 games of action, Goodwin has pulled in 12 catches for 259 yards. He does have 4 TDs, but his production has been a far cry from what the 49ers have needed him to be. Veteran Pierre Garcon has also been battling injuries and has logged 21 catches for 230 yards. While he provides a veteran presence, he hasn’t been producing statistically for this San Francisco team. Fullback/Swiss Army Knife Kyle Juszczyk is actually 3rd on the team in receptions with 19… that kind of tells you everything you need to know about this offense. In the backfield, things have been a little more promising. After Jerick McKinnon went down in September with a torn ACL, the 49ers would rely on the tandem of Matt Breida and veteran Alfred Morris. Both have been banged up through 8 games, and have alternated responsibility as “the” guy in the backfield. When you look at the big picture, though, Breida has been far more effective. With only 7 more carries, Breida has run for 200 more yards than Morris. His 5.8 ypc far outpaces Morris’ 3.6 ypc total, and the offense has been more effective with Breida as its focal point. Raheem Mostert has pitched in as well, logging 175 yards and catching a few balls in the process. Many though Mostert might break out last week with Bredia’s ankle injury rearing it’s ugly head again, but instead, Brieda logged 16 carries. It’s anyone’s guess as to who will get the workload moving forward; but, the numbers show Breida gives this offense the best chance to be competitive. Oakland’s season has been tumultuous– that much is obvious. With many franchise names leaving, some have questioned the unity of the Raiders’ squad. 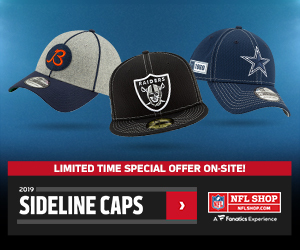 Early in September, Khalil Mack was traded to the Bears in exchange for multiple picks, and earlier this month, Amari Cooper was traded to the Cowboys for a first-rounder. With Head Coach Jon Gruden seemingly stockpiling picks for a full rebuild, many Raiders questioned whether they’d survive the trade deadline. When the dust settled on Tuesday, though, QB Derek Carr was still donning the silver and black. Carr has been mediocre this season, with a QB rating of 94.5 through 7 games. He’s completed 72% of his passes, logging 2,027 yards and 10 TDs to 8 INTs. In his 5th season, Carr has had some very strong performances, including his 437 yard game in Week 4, where he put up 4 TDs on a much improved Browns defense. Then again, just last week, Carr completed 75% of his passes en route to a 3-TD afternoon against the Colts. With those strong games, though, came some absolute duds. In Week 1, he failed to throw a TD while throwing 3 INTs in a matchup with the Rams. Then, in Week 6, he only had 142 yards on 31 attempts. Needless to say, it has been a roller coaster ride by the Bay so far this season for Carr. 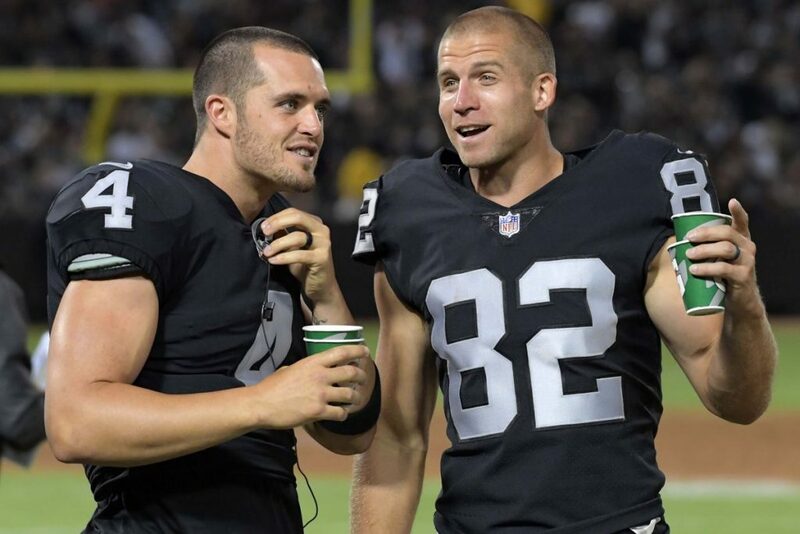 Unfortunately for Carr, his top 2 receivers from last season are now gone, with Michael Crabtree signing with the Ravens, and Cooper being traded earlier this month. These wideouts’ departures left Carr with a group of pass catchers headlined by the 33-year-old Jordy Nelson. In his 10th season, Nelson has lacked the productivity we became accustomed to in Green Bay. Nelson has 23 catches for 337 yards so far this year. However, that number is inflated by his ridiculous Week 3 game. In that game in Miami, Nelson took 6 catches for 173 yards (28.8 ypc) and scored a touchdown. In his other 6 games combined, Nelson only has 164 yards (27 yards per game.) Needless to say, they’ll need more out of their WR1 to be competitive with Cooper having left for Dallas. Martavis Bryant (who’s had trouble staying on the field), Seth Roberts, and Brandon LaFell will be asked to step up. However, it remains unclear whether either will emerge into a clear #2 option. Instead, Jared Cook has experienced a breakout year in Oakland. In his second year with the Raiders, Cook has logged 474 yards on 36 catches and added 3 TDs in the process. He’s on pace to have the best year of his career in his 10th season, which is certainly not something you see every day. Cook will likely see even more targets with Cooper gone, and a cloud of questions at the receiver position. Carr has had isolated excellent games in his career, and one can expect Cook to be the main beneficiary when those games come. Otherwise, I expect a ton of production out of the veteran TE on a game to game basis, mostly due to a lack of other options in Oakland. The bad breaks continue for this pair of Bay Area teams when you look in the Raiders backfield. Son of Oakland, Marshawn Lynch was placed on Injured Reserve last week for a groin/core injury, ending his season. While he’s not under contract for 2019, there’s a chance we’ve seen the last of Beast Mode. For the time being, the backfield duties are split between early-down back Doug Martin and pass catcher Jalen Richard. Martin joined the Raiders this season after 6 seasons in Tampa Bay. His career has been average, aside from two exemplary seasons (2012 & 2015) where he eclipsed 1400 rushing yards. Now with the Raiders, mostly due to Lynch’s presence, Martin hasn’t had the chance to prove his abilities. However, in split backfield duties last week, he took 13 carries for a productive 72 yards. Should he be able to replicate this 5.5 ypc on a game-to-game basis, the Raiders just might have themselves a productive fill-in. Jalen Richard, on the other hand, functions more as a receiving threat for Oakland. So far this year, he’s caught a team-high 39 balls for 303 yards. With the Raiders trailing constantly this season, Richard has gotten his fair share of opportunities, even with Lynch in the fold. One would expect these opportunities to keep coming, as the Raiders have an uphill climb for the rest of their schedule. Last week against the Colts, Richard took 8 catches for 50 yards. He’s caught 6 or more balls in all but two games he’s played this year and has already passed his career-high season receiving total (256 yards last season.) In his third year out of Southern Miss, Richard seems to be on the upswing and is hoping to cement himself in the Raiders backfield for years to come. Defensively, these two teams are among the league’s worst. Both rank in the bottom 5 of the NFL in total points (against), and points per game. The 49ers’ unit is paced by Fred Warner. The rookie MLB out of BYU has a team-high 66 tackles through 8 games, which ranks 7th in the NFL. Reuben Foster, in his second year, is 2nd on the team in total tackles. Foster missed practice on Tuesday with a hamstring injury and is in danger of missing Thursday night. Veteran DeForest Buckner leads the team with 4.5 sacks. Arik Armstead has also been productive in the pass rush, logging 3 sacks. The 49ers secondary ranks in the bottom 10 of the league, having allowed 18 TD to only 2 INT so far this year. Those INTs were logged by Antone Exum and Jaquiski Tartt. Unfortunately, both Exum and Tartt haven’t practiced yet this week, and are both highly questionable for the TNF contest. Veteran DB Richard Sherman was brought in from Seattle and has locked down his opposing WRs, as he has for his whole career. After that, though, things have been a bit grim. Oakland hasn’t quite recovered from the loss of Khalil Mack, who’s widely regarded as one of the game’s greats. Linebacker Tahir Whitehead has led the team defensively with 50 combined tackles. However, the Raiders haven’t generated a pass rush all season, as they rank last in the NFL with only 7 sacks. Needless to say, they’ll need more pressure to compete with teams down the stretch. If CJ Beathard doesn’t play on Thursday, Nick Mullens will find himself in an ideal situation with a lackluster pass rush coming his way and a hopefully clean pocket to throw from. The Raiders lost a veteran presence and depth in their secondary with Dominique Rodgers-Cromartie’s retirement earlier this week. With DRC out of the fold, and Gareon Conley popping up on the injury report to start the week, the Raiders might be quite shorthanded on Thursday Night. Conley’s potential absence would leave it to Rashaan Melvin and Leon Hall to keep the 49ers’ receiving corps at bay. Safeties Reggie Nelson, Karl Joseph will certainly have to help out over the top. With injuries and two already shaky defenses, I’m looking for the over to hit on this game. Well, this one is a doozy. With the number of injuries that each team has sustained, no result would surprise me. However, the possible absence of CJ Beathard could be a huge blow for the 49ers. I think that the most likely result is that we see a very sloppy defensive game with quite a few long touchdowns. I think this has the potential for either team to run away with it. 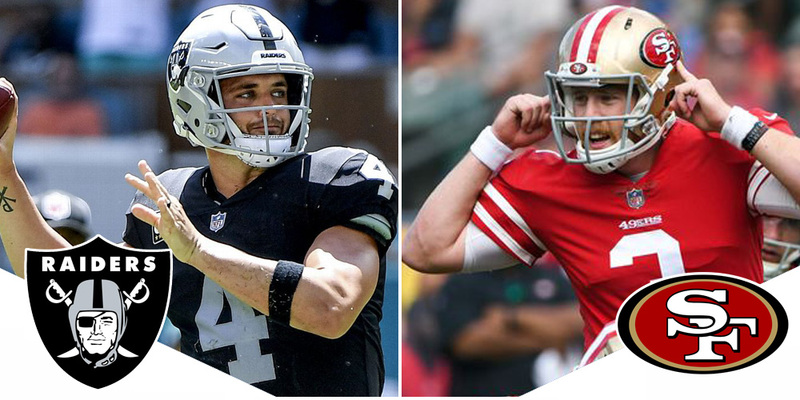 However, when the chips are on the table, my money’s on Derek Carr to outplay Beathard, or Nick Mullens, should he be “the guy” on Thursday. With Beathard shaping up to be a game-time decision, one would have to assume he’ll be at less than 100% if he goes… so even if he plays, I think the Raiders have more firepower. Not to mention, if we get down to crunch time in the 4th quarter, I have to take Carr over either of the 49ers young QBs. As a side prop recommendation, look for Jared Cook and Jalen Richard to combine for upwards of 18 catches in this game. While it does scare me that the game is in Levi’s Stadium as opposed to the Black Hole, I think the Raiders pull it out. I’ll take them to win 26-22.